Unless your job requires you to dress professionally, you are probably sitting there reading this blog post while sporting a stretchy, oh so comfy, pair of yoga pants that have seen better days. Let's be honest-- I don't blame you. Those things are probably the comfiest damn things on the face of the earth. However, after wearing yoga pants most days for a couple of months into self-employment, I realized that it needed to end. 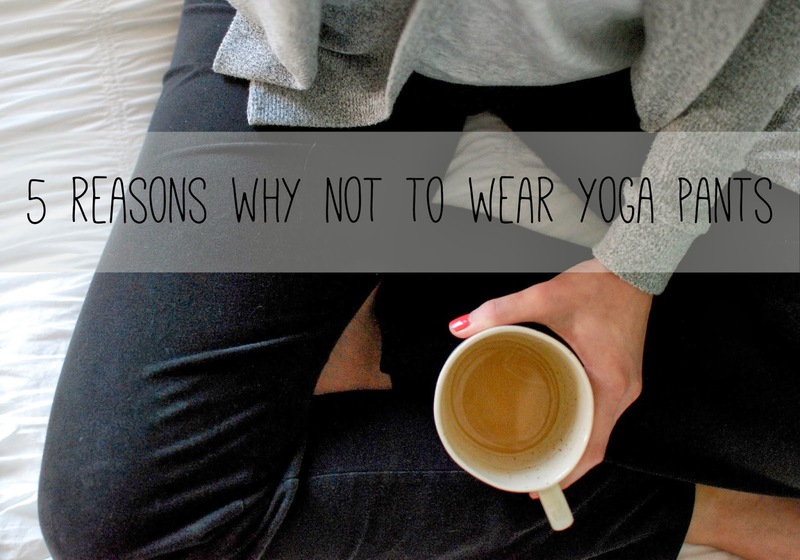 Wearing yoga pants was quite possibly one of the worst things that I could be doing for myself, and I needed to break the habit. If you think I've totally lost my mind at this point, I'll convince you otherwise. 1. You shower. Think about it. How many times do you crawl out of bed, throw on some yoga pants, and then stumble to the kitchen to grab a cup of coffee, never to change out of those yoga pants for the rest of the day? Yup. That was me. And quite honestly, after a while I just started to feel dirty if I still hadn't taken a shower by late afternoon. 2. You feel better about yourself. If you've showered, taken the time to put on a nice outfit, and have accomplished this by 9am, then that's a win. You will feel 200% better about yourself. You won't feel like a slob. You'll feel put together and most likely have a better body image of yourself, which only leads to a better outlook for the rest of your day. It's a confidence booster. 3. You become more productive. Getting out of those yoga pants and into a nice outfit will make you feel like you're on a mission. If you can accomplish that, I guarantee you'll start your day with more motivation to accomplish your goals for the rest of the day. I have noticed that on days that I don't shower and put on real clothes by 9am, my entire day slowly becomes a complete waste. I often like to throw on a cute pair of shoes in addition to getting nicely dressed. Cute shoes always up the ante. 4. They're an incentive to work out. If you're like me, you love fashionable workout clothes just as much as any other type of clothes. Choosing a few pairs of yoga pants that you really love can be an added incentive to be active and sweat it out. If you work out, then you get to wear your yoga pants. Use them as an incentive to be active, not to lounge around the house. 5. You have more reason to shop for cute clothes. What's the point of shopping or buying fashionable items when you never wear them? Not wearing yoga pants all day makes me more excited about what I can do with my day to day wardrobe. I love being able to dress for my mood. For example, if I'm feeling like a rock star businesswoman that day, I choose a blazer and pumps. And, knowing that I'll actually be wearing the clothes I purchase makes it easier for me to justify buying them. I've stuck my guns with the No Yoga Pants rule for a few months now and it's a game changer. Of course I indulge on the weekends and have at least one lazy day because we all deserve that. However, I've jumped ship on the yoga pants during the week. Have I convinced you yet? Are you guilty of wearing yoga pants non-stop?